Have you ever wondered how to say “cheers” in different languages? 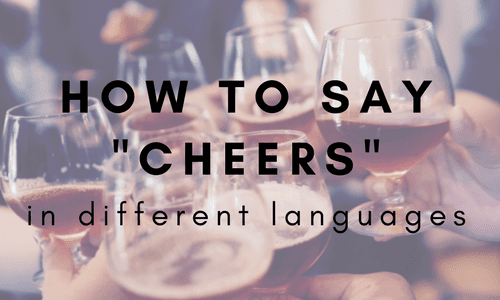 Think of all the situations in which the word “cheers” is used and you’ll quickly realize the versatility of this common expression that spans across cultures and nations. Whether you’re traveling, studying abroad, or simply making new friends of another culture, being able to say “cheers” in their language shows that you respect their traditions enough to make an effort to learn something new. Keep reading to learn how to say “cheers” in different languages, 20 to be exact, and use this new vocabulary when you celebrate graduations, milestones at work, weddings, birthdays, holidays, and more! China has an entire drinking etiquette and respect plays a huge role in the society. If you’ve ever heard about Russians being heavy drinkers, this is not a stereotype but reality! People in Spain start to drink very late, but they also party longer than you can imagine! In Japan, it’s impolite to turn down a drink. If you’re traveling there soon, make sure to try the national drink – Sake! In general, Arabic countries share an under-the-table drinking culture since most religions prohibit the consumption of alcohol. Did you know that Oktoberfest originated in Germany? If you haven’t been to one of these festivities yet, you’re missing out! Many Portuguese drink slowly and steadily throughout the entire day. It’s not uncommon for the party to start around 3 PM and continue onto an after party. One bonus about drinking in France – you can find an exquisite glass of local wine for only three euros! Vietnam is one of the top countries for beer consumption. Sometimes beer is served with ice and if one person drinks, everyone has to! Korea is home to some unique hangover cures from soups to spas to specially made beverages. Zubrowka is the most famous brand of vodka in Poland. It’s served chilled and in 50 milliliter shots. In Italy, an aperitivo is a pre-meal drink similar to our “happy hour.” Its purpose is to stimulate your appetite! Fun fact – In Thailand, alcohol can only be purchased or served between 11 AM to 2 PM, or 5 PM to midnight. Raki is the national distillated drink in Turkey. Istanbul has an incredible nightlife, but be careful – it’s not cheap! In Belgium the legal drinking age to drink wine and beer is 16, however the age for spirits is 18! Have you ever tried Amarula? This creamy liqueur is made from the fruit of African marula trees which surprisingly, elephants also enjoy! The Greeks love their wine! If you’re traveling there soon, try Retsina. It’s a unique wine that gets its flavor from pine trees. Alcohol is very expensive in Sweden. There is only one chain store in the country that sells alcohol and it closes at 3 PM on Saturdays! Learning a new language improves your travel experiences, helps you build cross-cultural friendships, and develops an appreciation of other cultures. You’ve made a great start by learning how to say “cheers” in different languages. Want to learn more useful phrases in the language of your choice? TakeLessons Live offers the chance to try out a variety of languages with access to 300+ online classes. Find out how you can improve your conversational French, Spanish, Korean and more today! Guest Post Author: Michaela F. from Study Abroad Apartments.